Garanti posted strong results. FY17 net profit rose 25% year on year to TRY6.3bn (unconsolidated), driven by a 23% increase in NII as NIM rose 29bp to 4.8% and loans grew 13% to TRY208bn. Loan growth was hugely weighted towards the first half, driven by the Credit Guarantee Fund. The current stock of CGF loans is TRY14.5bn (total 2017 originations: TRY18.2bn). The NIM performance was particularly impressive, highlighting Garanti’s ability to reprice loans in the face of higher deposit, wholesale and CBRT funding costs. Encouragingly, despite the increased lending, the overall loans/deposits ratio was relatively little changed YoY at 115%. However, the disparity between the TRY and FX funding positions was extreme: in TRY, the L/D ratio came in at a very stretched 159% (down from a peak of 171%), while in FX it was a strong 73%. On an adjusted basis, the loans/deposits ratio stands at 79%. Asset quality improved once again, with the NPL ratio dropping 30bp YoY to 2.8% and the net cost of risk dropping to 68bp (down YoY but up QoQ) as bad loan formation declined among corporate and commercial customers, although Group II loans jumped sharply following the re-classification of the Otas loan. Moreover, the CET1 ratio improved YoY by 130bp to 16.5%, as the CGF attracted a 0% risk-weighting. On a consolidated basis, Garanti's full-year 2017 core operating income rose 49% YoY (+6% QoQ) to TRY9.6bn. NII (excluding income from CPI linkers) increased 21% YoY to TRY12.9bn, while Fees & Commissions rose 18% to TRY3.9bn. Opex was well controlled, rising just 8% to TRY 7.6bn as the bank’s digitisation drive continued, meaning that the cost/income ratio improved 4.1ppts YoY to a respectable 46.2%. We are particularly happy to see the progress in NII after the increased funding costs the bank has faced this year. This represents a victory for management, who have built a book well suited to an environment of rising rates (ie, relatively short average loan maturities that are easily re-priced). In the event, NIM (including swap costs) increased 30bp YoY to 4.7%. In contrast to AKBNK, the lion’s share of this success came from loan repricing as opposed to the securities portfolio. The strength of the P&L was complemented by an improvement in asset quality. Garanti started in a weaker position than AKBNK, albeit still a strong one, but managed to keep the majority of asset-quality indicators on a positive trend. Provisioning costs (net of collections) declined 25% YoY to TRY1.6bn (or 74bp of total loans on a consolidated basis), while the headline NPL ratio fell back 40bp YoY to 2.6%, bringing Garanti below the sector average of 3.0%. 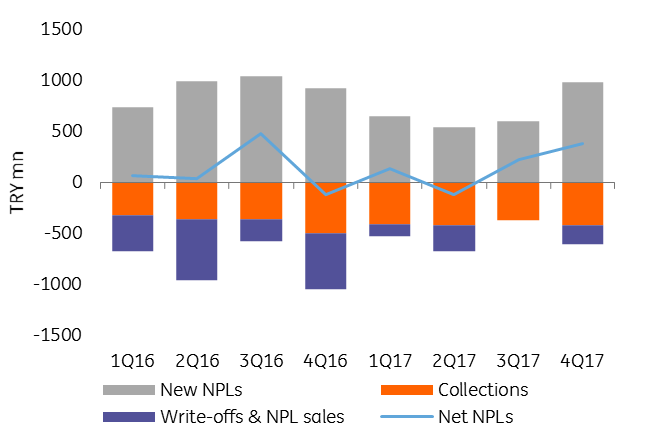 Net NPL inflows decreased markedly on a net basis (see chart), as an uptick in gross inflows was offset by write-offs, collections and NPL sales. Anecdotal evidence suggests, however, that those NPL sales that were achieved fetched a better price than was the case six months ago. The Group II loan ratio rose from 4.9% to 7.5% over the period due to the reclassification of the Otas loan, which represents a US$1bn exposure for Garanti. While Garanti’s balance sheet remains robust, we have observed some weakening in key liquidity metrics. The loans/deposits ratio rose by 2ppts YoY to 114% as the bank sought to minimise funding costs by increasing use of swaps rather than engaging in a contest for deposits; however, this remains better than the sector average of 120%. 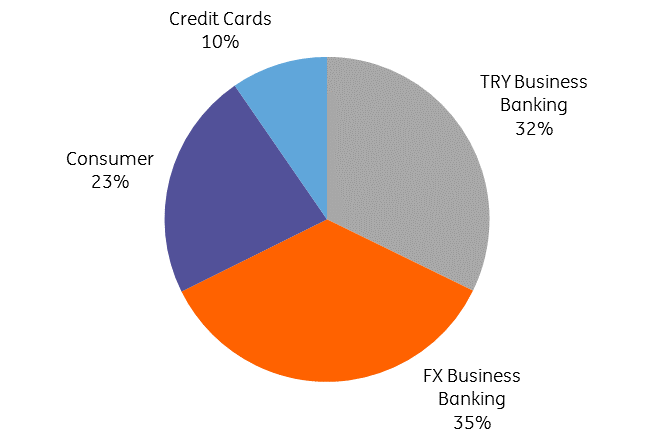 For TRY, the loans/deposits ratio rose 4ppts YoY to 162%, reflecting the surge in TRY lending following the introduction of the CGF and the dollarisation of Turkey’s deposit base. However, this was an improvement on the 171% posted at end-1H17. In FX, the ratio was a very healthy 75%. Meanwhile, the CET1 ratio increased 110bp YoY to 14.7%, due mainly to the surge in CGF lending, which attracts a 0% risk weighting. GARAN’s capitalisation has now surpassed that of AKBNK, one of the best in the sector. Total CAR stood at 16.8%, up 210bp YoY following the successful issuance of a Tier 2 debt instrument in May. We expect further such issuance to follow over the coming years. The performing loan book grew 14% YoY, as demand for TRY loans surged. We note that the share of TRY loans in the book grew significantly (+7ppts YoY to 65%). Stripping out the currency effect, the TRY loan book increased 20% YoY, while FX lending fell 3%. Overall, TRY Business Banking loans grew significantly (+28%, aided by TRY 18.2bn of credit extended under the auspices of the CGF; the current stock of CGF loans stands at TRY 14.5bn); to 32% of total loans, while Consumer loans (+19%) and Credit Cards (+15%) also posted robust contributions. Loan growth was slower than the sector as a whole across all loan classes. Garanti is now the top-ranked provider of consumer loans (22% market share among private banks), retail mortgages (25%) and consumer auto loans (45%), showing that its recent focus on consumers is bearing fruit in terms of P&L. While this does leave the bank more exposed at the margin to volatile sectors if growth stalls, its main business remains corporate lending, which mitigates our concerns on that score.